News and reviews of restaurants, theater, movies and travel. Go west, young family! Devil’s Thumb Ranch revisited. Sunset at Devil's Thumb Ranch. All photos courtesy Courtney Drake-McDonough. We woke up in the city but went to sleep in the old west. Well, almost. It was more like an idyllic vision of the old west –sprawling, pastoral, rustic, elegant and a whole lot of fun – but with all the modern conveniences. 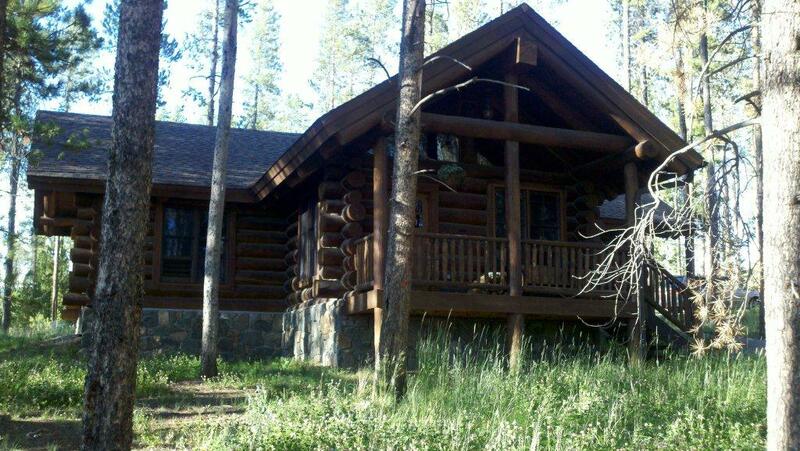 Our little cabin in the woods. befitting their log walls and roof than the lodge. They are a little on the rough side but with plenty of comfort and all of the necessities – feather beds with handmade quilts, a kitchen, a living room and spacious bathroom. Following the example of all other buildings at Devil’s Thumb Ranch, the cabins are built as green as possible with geothermal heat, courtesy of heated flooring not lost on bare feet on crisp, cool mornings. By staying in the cabins, you can choose to cook your own meals. However, if your idea of a vacation getaway means getting as far away from cooking as possible, you are in luck. There are a variety of restaurant options for the whole family. Heck’s Tavern is casual, perfect for families, with kids’ menus for breakfast, lunch and dinner. Even the up-scale Ranch House Restaurant has a kid’s menu or half portions of adult entrees for kids with sophisticated palates. Stop into Hallowed Grounds Coffee House for sandwiches or a smoothie before heading out on a hike. Or just get a bite poolside from Heck’s. All meals are prepared from scratch, using natural and local ingredients. 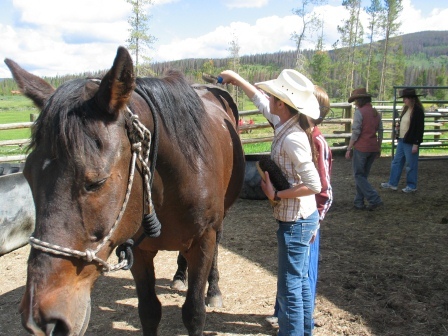 Our daughter at Wrangler Camp, learning to tend her horse before going on a ride. On this trip, our daughter attended the Wrangler Camp, held in multiple sessions throughout the summer. Along with just six other kids, she learned horse-riding and horse-care skills including a little stint doing rodeo tricks. After nose-to-tail guided trail rides, the afternoons of Wrangler Camp were spent fly-fishing, swimming, taking aim with archery and searching on a scavenger hunt. During those action-packed days, the rest of the family was free to take long hikes, enjoy the spa, game room and build an impromptu mini-log cabin. We also had fun just walking around the property, enjoying amazing views and seeing the various buildings including the Broad Axe Barn, Spa and the new Yager House, which houses family reunions, cooking classes, weddings and other special events. Up at the Stables, you can see horses, goats, chickens, rabbits, a calf that walks around like a dog, with the dogs and Stormy, the resident black cat. At night, guests gravitate to Heck’s patio to make s’mores around the campfire, sharing stories, laughs and suggestions for hiking and biking trails – all with strangers. It’s a good lesson for kids to see that you can find things in common with people you don’t even know, who are there from other states and even countries. Imagine swimming with this view! great deal going on. The cabins are more expensive than the Lodge rooms but then again you have a little cabin all to yourself and can save money by cooking your own food. Sign up on their website (www.devilsthumbranch.com) to receive notification of lodging deals year-round. Although the mid-week gets you the lowest rates, stick around for the weekend for the Cowpoke Camp. Giving kids and parents time together and time apart, the Camp lets kids ages 5 to 12 do fun western-themed activities like learning to lasso, build a compass, go fishing, taking a kiddie cooking class and more. For those who want to rough it a little more, go horseback-riding, take riding lessons, let the kids have a pony ride, go on a family wagon ride or get really serious and go on a cattle drive or zip-lining! I’m telling you, the folks at Devil’s Thumb Ranch are brilliant! There is literally something for every interest, taste and skill-level and it’s all beautiful. 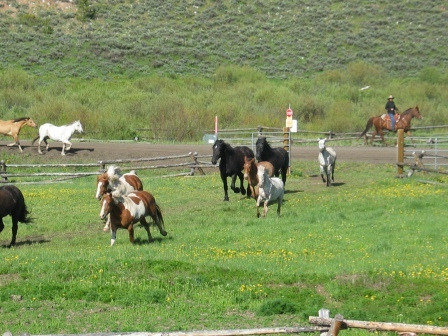 The horses heading to the pasture to graze. By the way, in case you are wondering about the name, Devil’s Thumb, according to local lore, after the warring Ute and Arapahoe tribes settled their differences in the Ranch Creek Valley area, they buried the Devil but left his thumb exposed to remind them of the evils of war. 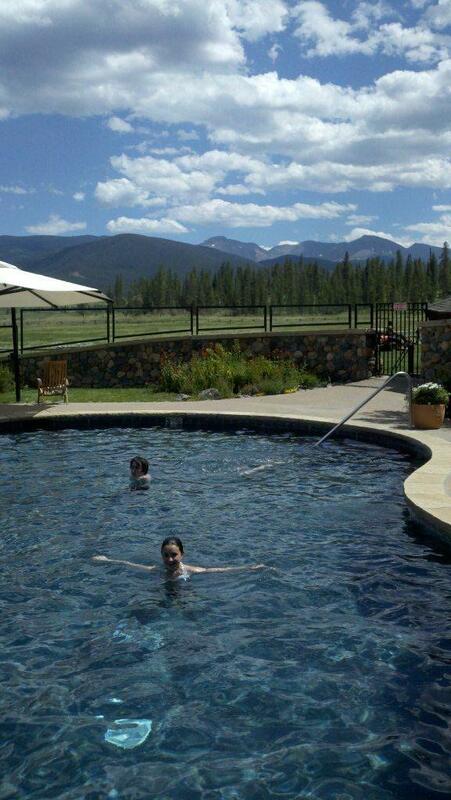 That “thumb” is an outcropping of rock on the Continental Divide visible from the Ranch. A Colorado couple and parents of two children, Bob and Susan Fanch, are the owners of Devil’s Thumb Ranch, intent on making the very sustainable property a getaway for everyone, from wedding parties to business groups to families. 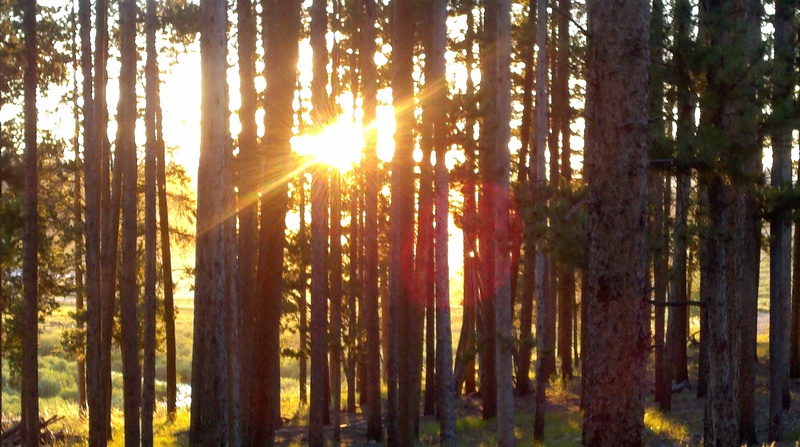 It’s a peaceful, kick-in-the-pants-fun place only about an hour and a half from Denver, making it a very doable escape. Note: A version of this article originally ran on ColoradoParent.com in 2011. That’s a Wrap! What Was In Good Taste in 2012? ← Is fashion art? Mais oui! Looking for Some Good Taste?